You’ll be met on arrival and escorted to the luxurious Fairmont Beijing Hotel. Experience life as a city resident as you browse in a market for produce to bring to your hosts, a local Beijing family who will offer real personal insight into this rapidly evolving city. Learn Tai Chi with a master as you join him for a private class at the Temple of Heaven. A Xian resident shares his lifetime of experience as you explore with him through a city market filled with exotic fare. Meet the chef over lunch at Xiangyue Villa in Shanghai and learn about his fascinating career that took him from Shanghai’s finest restaurants to San Francisco and back. 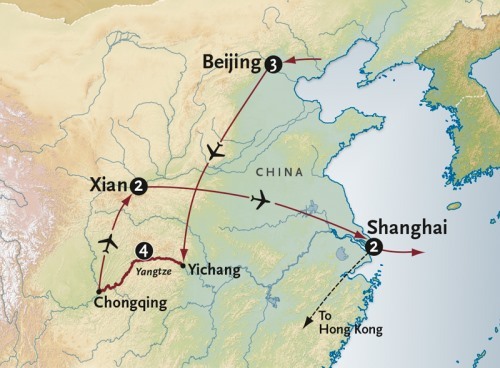 Attentive Trip Leaders, 5-star hotels in the heart of China's most important cities, extensive sightseeing and the finest ship on the Yangtze make this trip unforgettable. Be a Hong Kong Insider! Experience facets of Hong Kong which few visitors ever glimpse. We include your flight from Shanghai to Hong Kong, 3 nights at the 5-star Kowloon Shangri-La, daily breakfast, lunch at Jimmy’s Kitchen and our exclusive Be a Hong Kong Insider full-day tour.